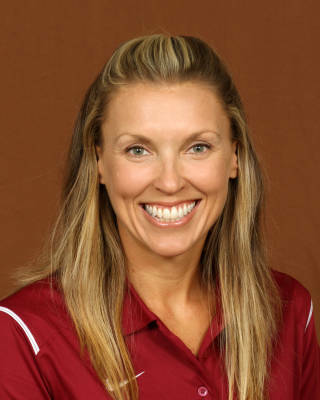 Entering her fourth season with the program, head coach Brooke Niles has shaped Florida State beach volleyball into one of the most elite teams in the country, establishing the Seminoles as a national contender every year and a fixture in the AVCA Beach Top-20. In only three seasons with Niles at the helm, the Seminoles have earned two NCAA National Runner-Up titles and secured three consecutive Coastal Collegiate Sports Association (CCSA) conference championships. Niles has led the Seminoles to 30 AVCA Top-10 wins in her three seasons, and since taking over the program prior to the 2016 season, Florida State has gone undefeated against every East Coast team without a single loss to a CCSA team since joining the conference. Since establishing the program as a powerhouse in the NCAA beach volleyball community, the Seminoles have seen a number of top performers come through the program to play for Niles. She has led six AVCA All-Americans (Julie Brown and Jace Pardon in 2016, Leigh Andrew and Brooke Kuhlman in 2017, and Vanessa Freire and Tory Paranagua in 2018), one CCSA Pair of the Year (Brown/Pardon, 2016) two CCSA Freshmen of the Year (Nikki Esposito in 2016 and Francesca Goncalves in 2017), and 14 All-CCSA performers (Brown/Pardon in 2016, Paranagua/Pellitteri in 2016, Andrew/Kuhlman in 2017, Freire/Paranagua in 2018, Horton/Luke in 2018). The team’s academic performance has flourished under Coach Niles, as the team continually records one of the best GPAs across the athletics department every year. Current senior Macy Jerger became the team’s the first two-time CCSA All-Academic Team honoree in 2018, securing the CCSA Scholar-Athlete of the Year award in both 2017 and 2018. Julie Brown, Jace Pardon and Katherine Plessy were all named to the CCSA All-Academic team in 2016. Hailey Luke became the first Seminole to be named to the ACC Academic Honor Roll five times, while Niles has seen 53 ACC Academic Honor Roll awards earned by 31 different athletes. One of her players has earned the ACC’s Weaver-James-Corrican Postgraduate Scholarship every year of her tenure, with Katherine Plessy winning in 2016, Leigh Andrew in 2017 and Vanessa Freire in 2018. Niles led the Seminoles to unprecedented heights during the program’s first season as an official NCAA Championship sport. Her first year in Tallahassee was highlighted by a series of program firsts including a school-record for dual-match victories (32), a conference championship, the top-seed in the inaugural NCAA Beach Volleyball Championship and a national runner-up finish. Niles set the bar even higher in her third season, scheduling 13 dual matches against ranked opponents in the regular season and finishing with a program-record 33 wins. Florida State reached its third consecutive NCAA Beach Volleyball Championship appearance, and seventh-straight postseason appearance, making FSU one of only two programs to make every NCAA and AVCA National Championship (along with Pepperdine). The Seminoles went undefeated to make it to the finals of the NCAA Championship for the first time, taking down No. 1 UCLA, No. 3 Hawaii and No. 5 USC along the way. FSU fell to No. 1-overall UCLA in the finals for the team’s second NCAA Runner-Up finish under Niles. FSU tallied 14 wins against AVCA Top-20 opponents in 2018, picking up four wins against higher-ranked teams. Through her three seasons at the helm, the Seminoles have remained undefeated against every East Coast team, and have not lost to a CCSA team since joining the conference in Niles’ first year. Niles saw two more All-Americans in her third season, as Tory Paranagua and Vanessa Freire became the program’s 12th and 13th All-Americans. Four Seminoles were named to the CCSA All-Conference team, Macy Jerger earned her second consecutive CCSA Scholar-Athlete of the Year recognition, and the program placed 19 on the ACC Academic Honor Roll. Niles is married to Nick Lucena, a Florida State graduate, professional beach volleyball player on the AVP Tour and Olympian in the 2016 Olympics in Rio. They have two children, Gunnar and Cole.